This policy applies only to the website https://sacallishotel.gr and not to any other websites that the user might consult or access through links that the Website may include. If you wish further information regarding the Website’s cookies please contact us at sacallis@yahoo.gr. Please read the following carefully as it contains the terms and conditions governing all electronic communications sent or received (as applicable) by SACALLIS HOTEL. SACALLIS HOTEL may amend these terms and conditions at any time without notice. You should check this webpage from time to time to review the current terms and conditions because they are binding on you. The content of e-mails and accompanying communications and attachments sent or received by SACALLIS HOTEL (collectively, “e-mail”) are copyright protected, confidential to SACALLIS HOTEL and may contain information that is legally privileged or protected from disclosure under applicable law or agreement. Attachments that are part of an e-mail may have additional important disclosures and disclaimers, which you should read. All e-mail from SACALLIS HOTEL may be read and used only for its intended purpose and only by the intended recipient. If you receive an e-mail in error, please (i) contact the sender immediately by return e-mail and (ii) permanently delete the email you received. Any, printing, copying, distribution, use or saving of, or taking any action based on, the information contained in any e-mail (including any reliance thereon) is expressly prohibited (except as may be expressly provided in written agreements with SACALLIS HOTEL . No rights in SACALLIS HOTEL intellectual property are granted by virtue of your receipt of an email, and SACALLIS HOTEL reserves all such rights. SACALLIS HOTEL and its licensors retain all intellectual property rights in all e-mails sent by SACALLIS HOTEL . You agree to take full responsibility for checking any e-mail for viruses and other harmful code, andSACALLIS HOTEL shall not be responsible or liable for any damages arising from or relating to any virus or harmful code which may be contained or embedded in any email. SACALLIS HOTEL reserves the right to monitor all e-mails sent or received through its systems. SACALLIS HOTEL makes no warranty as to the accuracy or completeness of the content, data or information contained in any e-mail and hereby disclaims any liability of any kind. Any opinions expressed in an e-mail are those of the author and do not necessarily reflect the opinions of SACALLIS HOTEL . SACALLIS HOTEL reserves the right to archive, produce to regulators and produce in litigation or governmental or judicial inquiry any e-mails sent or received through its systems in accordance with SACALLIS HOTEL policies and applicable law, rules and regulations. If you do not accept, and agree to be bound by, the conditions contained in this notice, you should not use e-mail to communicate with SACALLIS HOTEL . These terms may be amended, updated or otherwise modified, whether in whole or in part, at any time. The personal data, optional and compulsory, that you need to provide when you enter the web site or register for various applications related with services and products provided by SACALLIS HOTEL . and any additional personal data that will be requested in later stages are collected, processed, transferred, stored and used by SACALLIS HOTEL ., under its capacity as data controller, for the hotel and affiliates as well as by service providers, including the data processors and service providers as they are described below. SACALLIS HOTEL . obtains the information you provide when you proceed in general with actions for accommodations in our hotel, conduct business, opted in to receive news and offers from SACALLIS HOTEL . and use Applications related to our services, through our web site, reservation and call center, social media, when you otherwise voluntarily provide it to us, including in connection with our loyalty program and from our subsidiaries or other third parties. When you download and register to such an Application which is optional, please keep in mind that you may not be able to use some of the features offered by the Applications unless you register. When you register or use our web sites and / or an Application, you are required to provide certain personal data (such as your first and last name, email address, password etc.) by filling in the fields identified as mandatory in the registration form on the login page or document. Providing your sensitive personal data is optional and you may still be able to use the web sites and / or the Applications and all of its features. We may also use the information you provided us to contact you from time to time to provide you with important information, required notices and marketing promotions, under the condition that you give us your consent with a direct opt in a relevant specific request of our, noting to you that you can opt out at any time of by sending us an email at sacallis@yahoo.gr. Accepting our services and products and the use of our web sites and / or our related with SACALLIS HOTEL . Applications you give us the explicit consent to collect, process, use and store your personal data according to the applicable laws and this contract. The use of the web site and / or our Applications is not intended for use by minors under the legal age requirement. No one under the legal age requirement may provide any personal information to or through our web site and / or our Applications. We do not knowingly collect personal information from minors. If you are under the legal age requirement, please do not visit our web sites, don’t register to our Applications, don’t make any use of the above or send any information about yourself to us, including your name, address, telephone number or email address. In the event that we find out that we have collected personal information from a minor without verification of parental consent, this information will be deleted, upon the minor’s parent or guardian notification. If you believe that we might have any information from or about a minor, please contact us at sacallis@yahoo.gr. To the maximum extent permitted by applicable law and without limiting any other provision of this Policy, SACALLIS HOTEL . disclaims any liability for any personal data submitted in contravention of this clause. 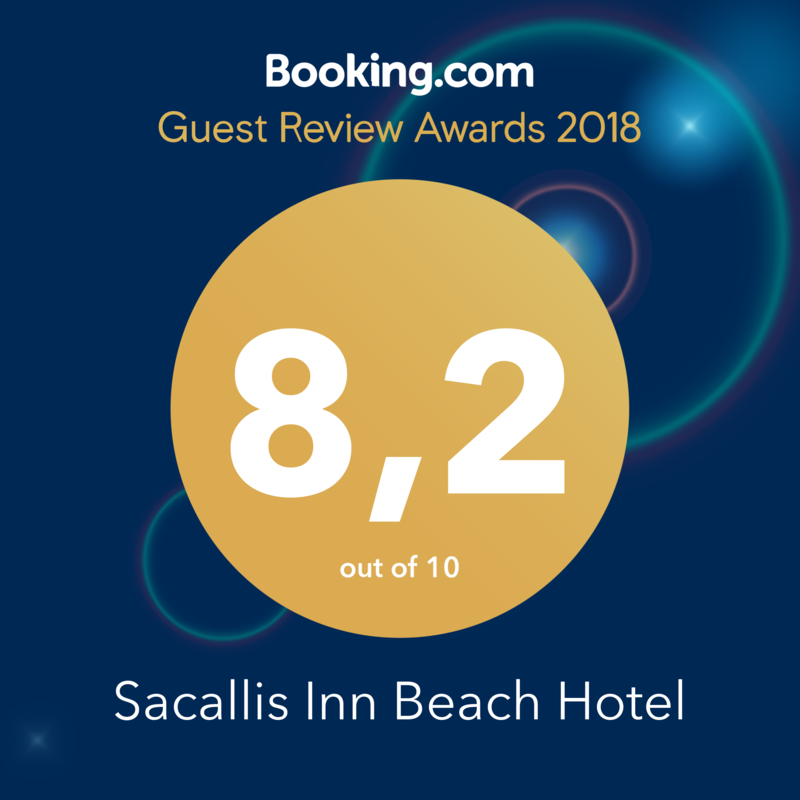 To measure and obtain data for administrative and other communication purposes and in order to operate and improve the effectiveness of our services, our website and s and Applications related the operations of SACALLIS HOTEL . These Suppliers independently provide their services, it will be clearly stated that their services do not concern us and may include other hotels, airlines, car rental companies, service providers, companies that organize package tours or bookings. All services provided by third parties are characterized in this way and are not related to our own services. Therefore, we encourage you to read the privacy policies and rules of providing the things and services of all third part service providers whose products or services you acquire through this website or through any or our employees. Keep in mind that these third parties may also contact you if they need to ask for additional information about you providing their services or responding to a request you have submitted. We are not responsible for any communication will be directly with them and you. SACALLIS HOTEL and its affiliates expressly disclaim any liability and the under-accepting guest hereby waives any claims which may be brought against the same for any kind of loss, injury or any kind of damages resulting from the services provided by the as above independent providers of services or goods.